In local Irish Folk circles Brier are a household name and their constant gigging list reflects their popularity across the country. Irish Folk Music is alive and strong with tourism and music festivals reflecting the success. The Bodhran, Flute Tin Whistle and Banjo will always keep the party going. 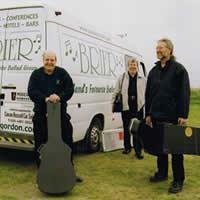 Brier started in 1986 as an Irish based Folk band and have travelled the world since. Tours include Ireland, England, Iceland, USA, Spain and Portugal. Early albums recorded include “The Sick Note”, Ballads & Craic” The band most recently recorded with Wren Records Ireland and although the members have changed over the years the consistent detail in their recording and live performance has kept the band busy over the years with many traditional folk and wedding parties covered. The latest release “Irelands Favourite Folk Band” Brier is on the Wren Records Label and continues to be popular in Ireland and overseas. Brier continue to tour and support Enjoy Travel Manchester on their annual trips to Spain and Portugal.